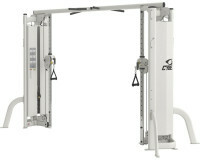 The exclusive Progressive Stabilization technique adjusts for height and horizontal position, supplying optimum stabilization (like selectorized gear) or free of charge standing motion (like most useful trainers). The Bravo's Progressive Stabilization system can also be positioned for partial stability, introducing certain difficulties for distinct functional projects. 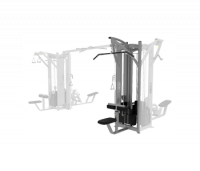 Systematic destabilization enables trainers to generate programming which builds strength and abilities in a progressive, hugely powerful way, providing new problems as users' capabilities grow. 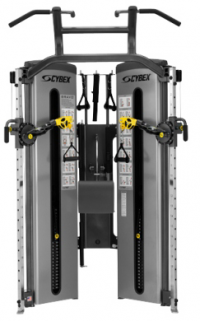 CYBEX FT-325 is a high performance, commercial-grade functional trainer that delivers an expansive range of exercises in a single, compact, low-profile unit. Which makes it the right fit for facilities where space is an issue, but getting a great workout is essential. 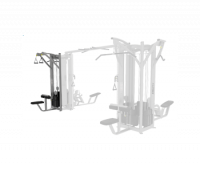 Includes two Adjustable Cable Columns with towers and stabilization, as well as a connecting tube with multiple pull-up and chin-up handles. Used when a Cable Crossover is desired as part of a "dual quad" Jungle Gym. 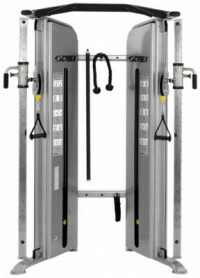 It includes two adjustable cable columns and a connecting tube with multiple pull-up and chin-up handles. Seat cushion is ergonomically positioned 17-inches from the ground. Seat is placed at a 10-degree angle to allow users clear access to the footplates. 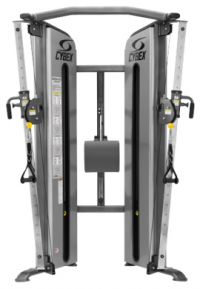 Pulley position allows for an optimal path of motion of the handle for rows. 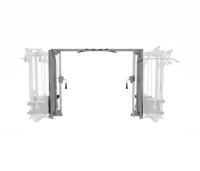 Dual handles for independent movement, and delivers a 2:1 lifting ratio when used independently. Diverging pulley alignment for natural movement. Seat cushion is ergonomically positioned 17-inches from the ground. Seat is placed at a 10-degree angle to allow users clear access to the footplates. Pulley position allows for an optimal path of motion of the handle for rows. 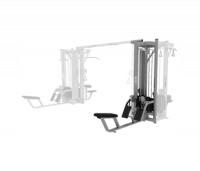 The forward-aligned pulley is carefully located to encourage correct form for the lat pulldown movement. 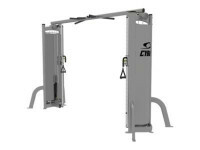 Dual handles for independent movement, and delivers a 2:1 lifting ratio when used independently. Diverging pulley alignment for natural movement. 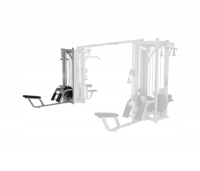 The forward-aligned pulley is carefully located to encourage correct form for the lat pulldown movement. Adjustable thigh pad provides stabilization for a wide variety of user heights. Adjustment tube has 22-positions, located 3" apart. The 2:1 lifting ratio provides for decreased inertia. Includes user-side weight shield.